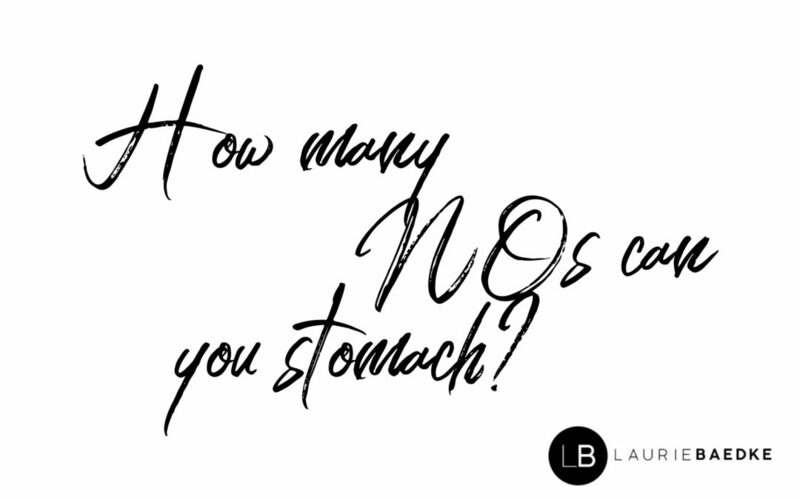 How Many “NO’s!” Can You Stomach? You may not know of Cordia Harrington. But chances are, you know her product. Her business, The Bun Company, makes the bread that can be found in McDonalds, Kentucky Fried Chicken and Chili’s (among other major enterprises), and is produced at a head-spinning rate of 1,000 buns/minute. By no means was this always the case. Cordia approached McDonald’s 33 TIMES before the food giant said “yes” to her goods. How many “no’s” would you allow yourself to hear – – before you just stopped asking the question? I’m betting your threshold for rejection is lower than you think. I say this only because we are an instant gratification society. If we don’t get immediate results — an immediate “yes,” we get discouraged. We give up. We go another route. I’m glad I didn’t give up. Go another route. Because in the end, an opportunity that was ultimately presented to me was far better than any of the positions I was passed over for—but, had I thrown in the towel after being rejected for those other positions, that opportunity would have gone to someone else. Like a lot of people starting out, my first healthcare job post-college was anything but glamorous. I had no desire to stay in my fledgling, administrative support position long-term, so I started applying for jobs within the health system that presently employed me and outside of the organization. In a matter of two years, I was passed over for two internal promotions and two external interviews for similar positions of incremental promotion (clinic coordinator – clinic manager type posts). It’s at this point that I began to grow very impatient. And discouraged. I could have thrown in that towel. But I stuck it out (after all, Cordia could be on the receiving end of a “no” 33 times—what’s a paltry four rejections?). In the end, my sticking it out resulted in what, roughly a decade later, was to be a defining point in my career. Through a mentoring relationship I had developed, a seasoned executive offered me a role as vice president of clinics for an area community hospital. I was 22 at the time. My salary more than tripled, but more than that, the opportunity this provided for advancement within my career and for my own professional leadership development was truly priceless. The two years where I was getting passed over for opportunities felt like an eternity. But, looking back, it’s little more than a blip on the radar. You have to put things in perspective, even when you don’t have necessarily a lot of perspective to go by as an entry-level professional. Maximize the short time between rejections–this comparatively small, yet crucial period in your career–to become stronger personally and professionally. Think: What am I doing with this experience? How am I applying the feedback received from others to change my approach to a position, or to equip myself better for the job? Instead of looking at others who seem to have it so easy, or even those who may have landed the gig you wanted, look to yourself. See what you’re doing to heighten the chances of your getting a “yes,” realizing that there are plenty of times when a “no” is simply beyond your control. Doesn’t mean every like position in every organization isn’t for you. Move on to the next organization, perhaps with a culture better suited for you. Don’t take it personally every time—like there’s something wrong with you. But do make it personal in the sense that you want to focus inwardly on what will best put you in the position to land that position! Even Cordia probably felt at some point like there was something wrong with her. I know how hard it was when I faced a fraction of the rejection she was up against. But now, Cordia is the envy of many an entrepreneur and executive. Just be sure to stash the towel away. You won’t be needing it. The Myth of the Well-Rounded Leader. Criticism is Part of Leadership: Are Your Shoulders Broad Enough to Take It?